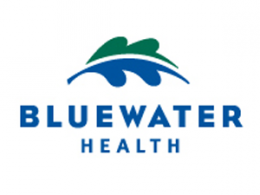 Our organization is located in Ontario within the Erie St. Clair Local Health Integration Network and encompasses Bluewater Health located in Sarnia, and Charlotte Eleanor Englehart Hospital of Bluewater Health located in Petrolia. Our staff, physicians and volunteers number nearly 2,500, making us Sarnia-Lambton’s largest public employer. We take great pride in our legacy of patient care, quality and service, and it is upon these strong foundations that we deliver on our mission, vision and values. Bluewater Health is the symbol of life, health and renewal in Sarnia-Lambton. Our logo is symbolic: a natural leaf image evocative of the combination of land and water that makes our community unique; an arch reminiscent of a famous local landmark. Both our name and logo reflect our philosophy of being the bridge of care our community depends on, a bridge to health and renewed well being. We create exemplary healthcare experiences for patients and families every time.